Violinist Linus Roth has followed up his discs of concertante works by Mieczysław Weinberg with a concerto by Weinberg's friend Dmitri Shostakovich. On Challenge Records, Linus Roth, the London Symphony Orchestra and conductor Thomas Sanderling pair Shostakovich's Violin Concerto No. 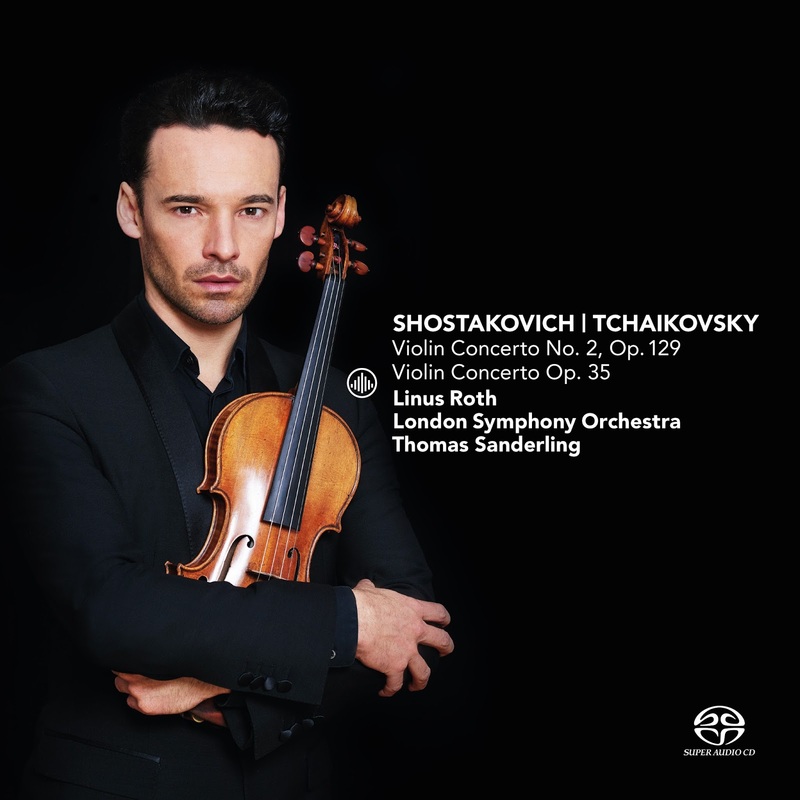 2, Op.129 with Tchaikovsky's Violin Concerto Op.35, with the Tchaikovsky being presented in the new critical edition. Shostakovich's Violin Concerto No. 1 was written in 1947, but there seems to have been something personal about the work because, whilst his symphonies formed his public utterances, the concerto was not premiered until 1955 (two years after Stalin's death). Shostakovich's Violin Concerto No. 2 followed in 1967, ostensibly for violinist David Oistrakh's 60th birthday. But the work is hardly celebratory in mood. Shostakovich was ill, aware of his mortality and the work has references to such works as the Symphony No. 4 and Symphony No. 15. This performance from Roth, the London Symphony Orchestra and Sanderling really brings out the dark intensity of the work, this is music with a story, a dark back story. It is a big work, with an opening movement lasting fifteen minutes (rather aptly the Tchaikovsky concerto is built on a similar scale). The first movement opens dark and threatening with Linus Roth's violin almost haunted in tone. Throughout, Roth plays with an elegantly vibrant sense of the line, giving a wiry strength to the tone. There are moments of dance-like music, but even this is inlaid with anger and there is much bleakness, the cadenza-like moment is more of a meditation on what has gone before. But Roth, the London Symphony Orchestra and Sanderling do not make the mistake of making the work relentless, it is full of character and vitality, over laid by Roth's singing tone; this violin is a survivor. The Adagio second movement is intense and melancholic, and though Roth makes the solo line sing, his tone is also inward. There are remarkable echoes of earlier Shostakovich works, almost as if the solo violin is meditating on mortality, and even the Jewish melodies fail to ignite. This is not a comforting work, despite the warm promise of horn calls later in the movement, and Roth makes it very personal indeed. The final movement seems to laugh in irony and there is a sardonic edge, though the violin keeps wandering off on its own, never reaching equilibrium, with the final dance being intensely sardonic. Written around 90 years earlier, Tchaikovsky's Violin Concerto has become familiar, even over familiar. And there may be undertones of a different variety in the work too, as Tchaikovsky wrote the concerto for the violinist Iosif Kotek, who was Tchaikovsky's lover (the booklet article, rather coyly, refers to Kotek as Tchaikovsky's very, very good friend). But this performance is the first to use a new critical edition, not that the changes are as significant as the recent new edition of the Tchaikovsky Piano Concerto No. 1 recorded by Kirill Gerstein (see my review). The eagle-eared will spot small changes, the biggest of which seems to be that the violinist keeps the mute on for the whole of the second movement. This creates a mood of greater intimacy, which seems to have inspired the whole performance. but Roth uses his technique in the service of music. The Canzonetta is, as might be expected, intimate and rather confiding, with lovely singing tone from Roth, making real magic with the orchestra. The finale, Allegro vivacissimo is wonderful vital and vividly exciting, positively toe-tapping.